The creation of the universe (sarga). The periodical destruction and recreation (pratisarga). The 14 different eras (manvantaras). The histories of the Lunar dynasty (Chandra vamsha) and the Solar dynasty (Surya vamsha). 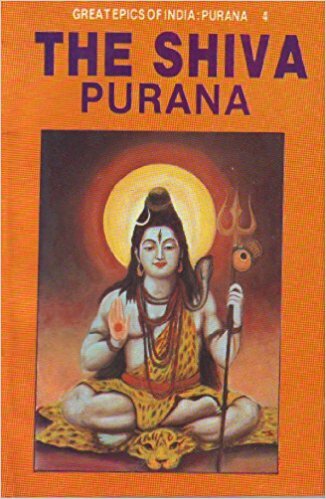 This time, I’m going to talk about the Shiva Purana. In some cases, the Shiva Purana is said to be the fourth one, but in others the Vayu Purana is said to be the fourth one. The Shiva purana has 24,000 shlokas. The Shiva Purana is said to be recited by Romaharshana, Krishna Dvaipayana’s disciple. The first part of the Shiva Purana talks about the Trinity in Hindu gods, which consists of Brahma the creator, Vishnu the preserver and Shiva the destroyer. It then continues by telling stories. I would like to share with you two of my favourites. Why do we not use the Champak flower to worship Lord Shiva: There was a Shiva temple in the land of Gokarna and Narada decided to visit it. As he was visiting it, he saw a Brahmana about to pluck a Champak flower. Seeing Narada, the Brahmana stopped himself from doing so. Casually, Narada asked the Brahmana what he was doing. The Brahmana replied that he was going to beg for alms. Narada then went and prayed in the temple. Meanwhile, the Brahmana quickly plucked the flowers and hid them in his basket, which was well covered. Narada emerged out of the temple and saw the Brahmana again. He again imposed the same question. The Brahmana lied a second time that he did not receive alms. Suspicious, Narada asked the Champak tree if flowers had been plucked from its tree. The champak tree denied it. Suspicious, Narada again entered the temple and found freshly picked Champak flowers. He asked a devotee inside who had put them. The devotee answered that an evil Brahmana had put them. Shiva would then bless him and the evil Brahmana had now brainwashed the king and had done many evil things. Narada questioned Shiva how he could have allowed the Brahmana to do this. Shiva said that he was helpless if anyone worshipped him with Champak flowers. He couldn’t resist them. Narada hereby cursed the Champak flower that it wouldn’t be used to worship Shiva as it had lied. Parvati becomes Gauri: Two asuras, Shumbha and Nishumbha obtained a boon from Brahma that they may not be killed by a male. After seeking the boon, they started wreaking havoc in all three worlds. In despair, Brahma went to Shiva and asked him to invoke Parvati, so that a female would be born from Parvati who would kill the asuras. Shiva agreed to the idea. When Shiva met Parvati and playfully addressed her as ‘Kali’ meaning black or dark skinned. Hurt by the term used to address her, she decided to pray to Brahma for many years to become fair She meditated for many years. One day, a tiger saw her and thought her to be a good meal. It patiently waited for her. Parvati, thinking the tiger to be her devotee, entered the tiger’s soul. As soon as she did this, his soul was truly purified and became a devotee of Parvati. Meanwhile, Brahma arrived at the spot, wanting to know the reason Parvati was praying to him. She told him everything and he granted her the boon. All the dark cells (kosha) fell from her body. From them emerged a dark hued goddess, Koushiki, and Parvati was hence known as Gauri (fair one) as she did not have a single dark cell. Equipped with the right weapons, Koushiki killed Shumbha and Nishumbha. Other than this, the Shiva Purana also mentions the different hells you go to for the different sins. 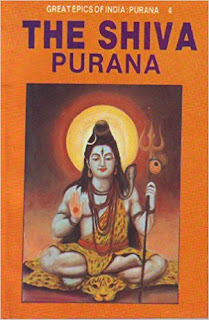 It also talks about the punya or merit, you can obtain if you read the Shiva Purana. Bibek Debroy did a very good job in writing this Purana. It is easy to understand and is interesting, as it has many stories.